How’d you spend your last $100, Spenser? I recently took a weekend trip with my wife to Fort Worth, Texas, my hometown and where my wife and I met in college. We went to see our friends and my family, as well as our alma mater’s homecoming football game. $40: Cash I paid a friend for two tickets to the football game, where it was blazing hot and I didn’t wear sunscreen. Had a great time but remembered why I hated being outside in Texas most months of the year. $0: Free alumni tailgate where I ate weird breakfast burritos and drank Coors Light that was technically free, but that I also probably paid for when I paid tuition three years ago. 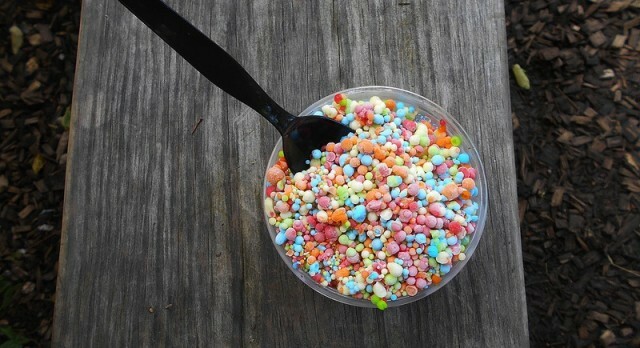 $8: Two small Dippin’ Dots ice creams, because it was so crazy hot. Had serious thoughts about stealing the cart and lounging in it so I can cover myself in little frozen balls of ice cream. $20: Tacos, queso, and beer at our favorite taco stand from college. Shiner beer can’t be beat. $2: Bottle of water at the Dallas airport. I hadn’t been fully hydrated since leaving Seattle three days previous. $5: Approximately 15 minutes worth of gambling at the slot machines during our layover in the dingy, moist Las Vegas airport. Tried to recreate the luck I had at a WinStar in Oklahoma in 2010. I didn’t. $15: Dinner at the Pei Wei in the Vegas airport, even though I had the same thing the day before. They don’t have Pei Wei in Seattle, so I gotta get my fill of faux-Asian grub while I can. Also, it was the only place in the terminal that looked remotely appetizing. $0: Gin and tonic on our third flight of the day, Vegas to Seattle, which was also delayed two hours. I needed said gin and tonic. I also watched the free Southwest TV on my wife’s iPad while she slept, and the episode of the Office where Michael Scott leaves came on. So there I was, nursing a watery airline cocktail and weeping openly as Steve Carell walked into the distance. I think that’s why they didn’t charge me for the drink.